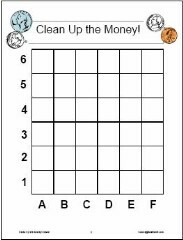 See Money Activities & Strategies for strategies for teaching money as well as some money games. See Math-Literature Connections: Money for suggested books to help students master money skills and concepts. 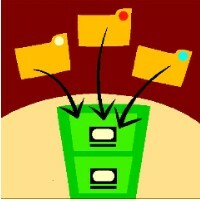 Internet links to additional activities for these books are also included. Clean Up the Money! Game: this 2-player game challenges students to toss 2 dice, form a coordinate pair, then collect the coin from that space, if there is one. First students alternate placing quarters, dimes, nickels and pennies on the gameboard. Then students toss a regular die and a special die (A-B-C-D-E-F) to form the coordinate pair and remove the coin from the matching space. Variations of the game are given but students must always find the value of their coins to identify the winner of the game so they get plenty of practice sorting and counting coins. Students may use these sites to practice money skills: counting coins, calculating change, using percents to compute tips. 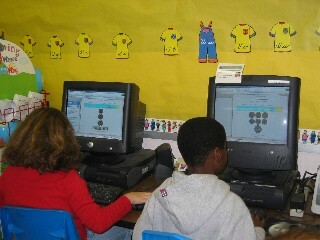 Play FunBrain's Change Maker to practice making change for different amounts. Students may work at different levels of difficulty. Play FunBrain's Penguin Waiter to practice using percents to compute the correct tip for dinner checks. Four levels of difficulty make it possible to meet the varied needs of learners in a class. In Little Finger's Cents Game students must count the coins shown, then enter the total value in the on-screen calculator. 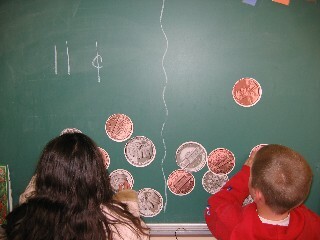 The Practice Counting Money Game requires students to drag coins onto the table to make the correct amount. In the easy version, a "helper" totals the amount as each new coin is added for immediate feedback on independent practice.